SAN DIEGO (KGTV) - U.S. Congressman Duncan Hunter (R-CA) and his wife Margaret were indicted by a federal grand jury in San Diego Tuesday on suspicion of converting more than $250,000 in campaign funds to pay for extravagant vacations and other personal expenses. The Office of the U.S. Attorney for the Southern District of California said the 48-page indictment includes instances from 2009 through 2016 in which the Hunters reportedly used campaign money illegally. The couple is also accused of filing false campaign finance records with the Federal Election Commission. 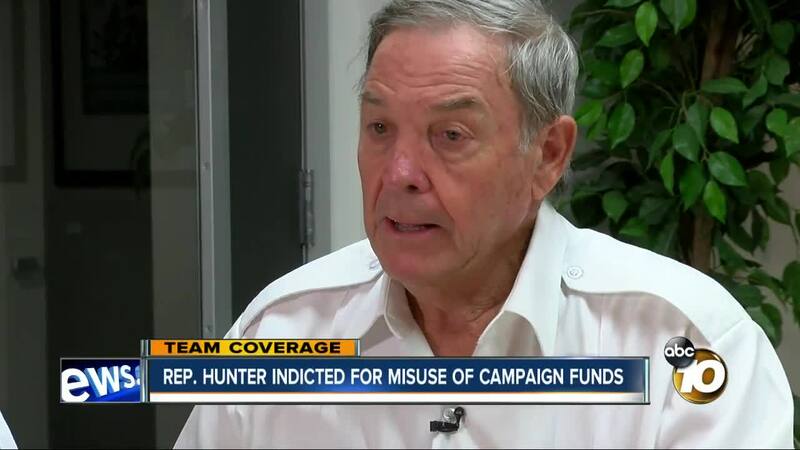 Hunter spoke to 10News about the initial investigation in February 2018 during an appearance on 10News at 6 a.m.
"There was wrong campaign spending, but it was not done by me. I have trust in the justice system despite what's going on with Trump and Mueller, and the anti-Republican, pro-Democrat forces within the Department of Justice, at the highest levels, and the FBI, at the highest levels. I'm optimistic on the outcome … it's been a year, that's a long time," said Hunter in February. See the video here . The affidavit claims the Hunters mischaracterized the purchases in FEC filings as campaign travel, dinner with volunteers or contributors, toy drives, teacher/parent and supporter events, gift cards for charitable donations, and gift basket items. The Hunters are also accused of paying their children’s tuition to Christian Unified Schools in El Cajon and claiming they were charitable contributions, according to the affidavit. The Hunters had been warned repeatedly about the prohibition against using campaign funds for personal expenses and repeated inquiries from Hunter’s campaign treasurer about questionable purchases, said U.S. Attorney Adam Braverman. Hunter's spokesman Michael Harrison responded to 10News about the indictment in a statement which read in part, "Congressman Hunter believes this action is purely politically motivated." A news release from Hunter for Congress also indicated that Gregory A. Vega, the former U.S. Attorney for the Southern District of California, made a request to Assistant Attorney General Brian Benezkowski to have two Assistant U.S. Attorneys recused from the Hunter investigation because they attended a fundraiser for Hillary Clinton's campaign in La Jolla. The recusals did not take place, according to the Hunter for Congress release. Duncan and Margaret Hunter will be arraigned on Thursday at 10:30 a.m. at a San Diego Federal Courthouse. They are charged with Conspiracy to Commit Offenses Against the United States, Wire Fraud, Falsification of Records, and Prohibited Use of Campaign Contributions. Hunter, 41, is a Marine Corps veteran and San Diego State University graduate. He won the race for the 53rd congressional district in 2009, taking over the position previously held by his father, also named Duncan Hunter. Rep. Hunter later represented the 50th district, covering much of inland San Diego County. His most recent challenger, Ammar Campa-Najjar, issued a statement, "The division, chaos and corruption in Washington has gone too far. Today's indictment confirms just how deep this corruption can reach when someone like Duncan Hunter Jr. is in it for himself instead of representing the people. Now is the time to put country over party and rise against this corruption and rise above the divisive politics. Together, we can bring real change and fresh thinking to represent the people of CA-50." House Speaker Paul Ryan Tuesday said Hunter will be removed from his committee assignments after being indicted.